New-decade birthdays are always memorable. For me, turning 20 was just as exciting as doubling my digits at age 10. I was in college, basking in the la-la land of having no real adult responsibilities yet still experiencing the pseudo-independence of living under a roof that wasn’t my parents’ but a roof they still paid for. The turnover to my 30s was much harder. My life had gone in a direction far different than I had planned. I thought I’d have a more secure sense of self by 30, and I passed that birthday wishing to figure out what was missing and hoping it wasn’t too late to turn it around. Now it’s that time again to close the door on one decade and open the door to the next. 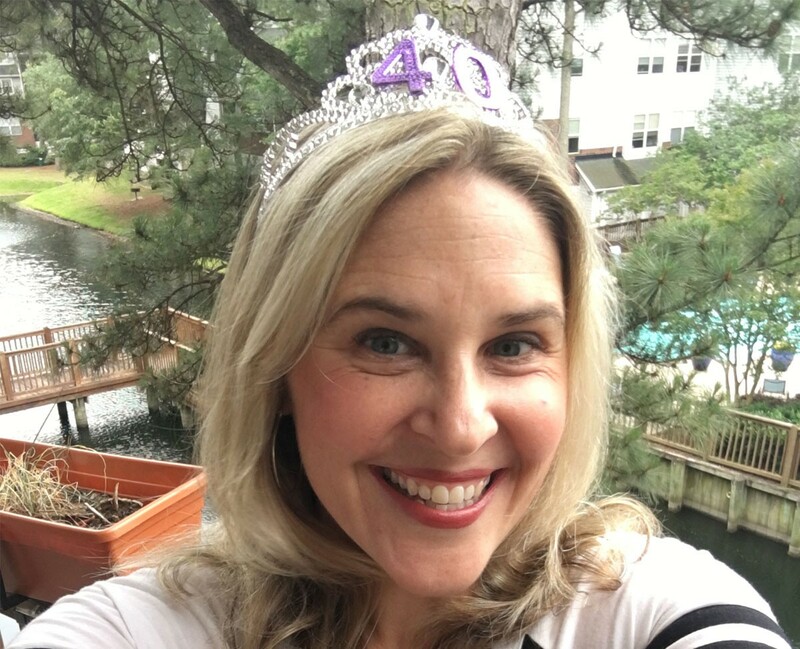 Facing 40, I took a stroll down memory lane, checking off the milestones: I traveled around the world; I had my second baby; I ran one full and seven half-marathons; I started the career I thought I wanted and then started another career I never knew I wanted; I got divorced; I became a Solo Mom; and I completely reinvented myself and my life. 1. Always accept your children’s hugs when they offer them. One day they won’t. As Solo Moms, we’re busy. If we’re not packing lunches and doing laundry, we’re catching up on work e-mails before hurrying out the door to get the kiddos to tae kwon do on time. And as we rush through our days trying to check everything off our to-do lists, we sometimes forget little things—like hugs. Now that my son is 12 years old, I miss our snuggles from when he was younger. Back then, those hugs were willingly given out for free. But these days, getting a hug out of my tween usually involves bribery. So when I do get one, I savor every second he lets me hang on before he lets go. 2. Take the time to snap photos—but not so much time that you’re not living in the moment. A few years ago, I took my kids to a museum, and when we got there, I realized I had forgotten my phone. I was almost frantic at the thought of missing this photo op and so upset I might not capture an amazing moment that I missed the fact that my kids had already run off to have fun without me. I didn’t want them to have fun without me! As much as I love having photo albums filled with precious moments, I’ve learned I don’t want to look back at those pictures and remember what the experience was like behind the lens. I want to remember the experience itself. I want to have fun with the kids instead of watching them have fun. So I try to find a balance between capturing moments on camera and then putting the camera away. 3. Done is better than perfect. When I was in college, buried beneath term papers, final exams, and fraternity parties, a friend told me to stop worrying, that “it will all get done.” And he was right. Whatever needed to get done somehow always managed to get done. Every sentence of an article I write might not be perfect, but it’s submitted. Every piece of laundry I fold might not be perfectly creased, but it’s put away. Every dinner I cook might not be perfectly nutritionally balanced, but my kids and I have the food we need, and we eat that food together as a family every night. Letting go of perfectionism made me more productive and less stressed—a combination all Solo Moms need. 4. Don’t feel guilty about taking time for yourself. You have a gift card for a 90-minute massage. You have reliable child care. You have no deadlines to meet, lawns to mow, dogs to walk, meals to cook, or anything else that would prevent you from disappearing for a couple of hours. So why feel guilty? I don’t know, but I always did. I would spend that massage making a mental list of everything I should be doing instead of allowing myself to relax. A stressed-out, tired mom is no good for anyone. Once I finally learned it wasn’t just acceptable to nurture myself but also necessary for everyone’s sanity, I started enjoying those massages and long runs and girls’ nights out and all the other ways I found to take some time for myself. And I became a better mom because of it. 5. The grass is always greener on social media. We all do it. We scroll through our Facebook and Instagram feeds and wish our hair looked that good, our marriage was that happy, our children were that smart, our bank accounts could send us on vacations like that. But as we beat ourselves up for not measuring up to our friends’ lives, we often forget that people tend to share only their highlight reels, not their behind-the-scenes shots. We’re seeing that Pinterest-perfect craft project but not the 12 thrown-out versions it took to get it right. We’re seeing that beautiful vow-renewal ceremony but not the marriage-counseling sessions it took to repair an almost-broken marriage. We’re seeing the newly purchased cars, boats, and houses but not the sleepless nights worrying about bills. So take everything on social media with a grain of salt. And don’t compare your behind-the-scenes reality to other people’s highlight reels. Sometimes I wish I could travel back in time and relive my 30s knowing what I know now. But learning these lessons is part of the adventure called life, the reason we proclaim ourselves older and wiser. And I can’t wait to see what lessons my 40s have in store for me.